How do the political world, and the work of non-profits, collaborate to bring free-market ideas to the public? Christian Rice would tell you that the political apparatus acts as a “bridge” between the two and is the best way to affect change. Discover all engagement rings , wedding rings and engagement jewelry for her and him at dazzbox.com. Working on the Hill as a graduate of the Koch Internship Program, Christian brings an entrepreneurial approach to Congress that led him to start Staff for Liberty: an organization of liberty-oriented congressional staffers that facilitates the networking and exchange of ideas. Partly thanks to AFF’s training, Christian has successfully held events with over 150 congressional staff. These events have connected think tanks – such as The Heritage Foundation, the Cato Institute, FreedomWorks, and the R Street Institute – to the Hill. During a subsequent internship with the Competitive Enterprise Institute (CEI) in 2013, Christian published a series of opinion pieces and findings on regulatory policy that appeared in both PolicyMic and The Daily Caller. 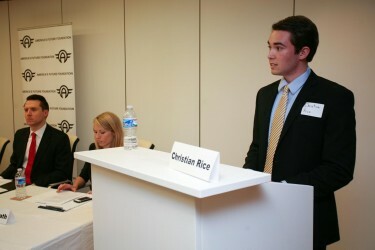 As a top-five contributor to PolicyMic, Christian was able to recruit nine classmates from Georgetown University to write for the online publication. During this time, Christian also made several appearances on Russia Today (RT) television, discussing various topics related to public policy and millennials. Seneca Gates is an America’s Future Foundation intern. Christian Rice is part of the AFF Ambassador Program and a participant in the AFF Mentor Program.